Whitetail hunting success is often a matter of being in the right place at the right time. Once in a while this happens by chance, but for serious big-buck hunters, studying the subtle details of the landscape is key to putting them in the position to succeed year after year. One of the first elements to study on any property that holds deer is the overall habitat. Does it offer sufficient food, shelter and water to support a healthy deer population? Once that’s confirmed, it’s time to identify transition zones, those areas where two different types of habitat converge. Whitetails frequently use such edge habitat as travel corridors, with a food source typically found on one side and protective cover for quick escape on the other. But transition zones are more than just secure feeding areas—they’re also where big bucks prowl when cruising for does, and where they concentrate their rubbing and scraping efforts. So pin down the seams where two distinct habitats meet and concentrate your efforts there. You’ll not only uncover the secret lives of deer on the property you hunt, you’ll also find the ideal ambush sites. Here are six top transition zones for putting you in the right place at the right time for trophy bucks. Secluded orchards are perhaps the best early- season draws for whitetails. Apples begin dropping in August, and by the time archery season opens, the deer will have had more than a month of conditioning to this favourite food source. It’s practically guaranteed they’ll sneak out sometime within every 24-hour period to sniff around the base of apple- laden trees, hoping to find newly fallen fruit. For bow season, apple trees located close to the forest edge are ideal, especially if they’re abandoned trees that aren’t harvested. It only takes a couple of apple trees that continue to bear fruit to attract deer looking to bulk up during the pre-rut. Some trees cling onto their fruit into early winter, attracting deer throughout the autumn. The trick here is not to simply find an apple orchard, but to locate one that has trees hugging the forest edge, where wary bucks will be willing to feed during legal hunting hours. As years pass and forests expand into old orchards, they can occasionally consume an apple tree, making it part of the fringe. Bingo! Here, deer can find the sweetest natural food source and stay hidden while they snack. On one of the properties where I hunt, for example, a couple of the old apple trees are now within the edge of a poplar stand, offering deer a perfect combination of food and security. Set up a treestand in the forest edge, 20 metres or so back from the last apple tree. With minimal trimming, cut a couple of shooting lanes and only hunt when the breeze is in your favour. Always enter and exit the stand from the downwind side so that your scent never taints the vicinity of the apple trees. In provinces where baiting is legal, you can keep the site active throughout gun season by dump- ing a few bushels of store-bought apples under the last tree. Only do this once most of the orchard’s apples have been eaten, even if there’s only a handful falling each day. Why? Because bruiser bucks become overly cautious when bait is introduced. This is likely due to the slightest whiff of human scent left on the ground or, more likely, the smell of human hands on the apples. If you do add apples, relocate your stand another 40 metres farther back into the forest. The new apples are likely to lessen the odds that a mature buck will approach the food source during daylight. Or maybe he won’t eat them at all. The does will eat them, however, while the buck hangs in the background. So by setting up farther back into the timber, you have a good chance of intercepting him during legal hunting hours. Find the game trail with the most buck sign, which shows the bucks are comfortable using the trail, and set up on the downwind side. Farmland abutting woodlots offers an abundance of edge habitat—and deer-attracting food sources. Hunting over crops such as soybean, corn, alfalfa, clover and winter wheat requires precise timing, however, as the deer will key in on different crops at differ- ent times, shifting to preferred foods as they ripen through the autumn. This is something to be mindful of if you’re hunting areas with fields containing a variety of crops. Clover and alfalfa are both awesome late-summer food draws, making them great for glassing for big bucks during dawn and evening summer scouting trips. But come October, these crops no longer rank if there are nearby fields of soy- bean or corn. During the early bow season, for example, I’ve counted the most deer in fields of soybeans. Soybeans are typically cut before gun season arrives, how- ever, and with little spillage, the fields no longer attract deer. Instead, the deer switch to stand- ing corn. And unlike soybeans, cut cornfields offer substantial spillage for whitetail din- ing, making them an excellent draw throughout gun season. Because of the increased visibility, however, mature bucks typically shy away from cut fields until it’s dark. For the post-rut, fields of green winter wheat or any standing corn stalks attract deer best if the snow hasn’t begun to accumulate. The crops you hunt should change as fall progresses, in unison with the changing menu preferences of the deer. So keep tabs on what they’re eating based on fresh sign, as well as photographic evidence from trail cams. Also keep in contact with the farmer or landowner so you know when each crop will be harvested. This will help you strategize your stand placement. No matter which crop the deer are hitting, the key to tagging a bruiser is to pinpoint the area where the most secluded portion of the field converges with the thickest part of the forest. Try to think like a buck—if you had to hide from human eyes, where would you sneak into the field to grab a bite? Is there a spot where you’d feel comfort- able during daylight? With the prevailing winds in mind, scan the field for a hidden pocket. The best scenario is where there’s a dip in the field along the transition zone. This drop in topography adds another layer of security for hungry bucks. During bow sea- son, a carefully placed treestand along the habitat edge should provide a terrific lookout for watching the forest exit point. 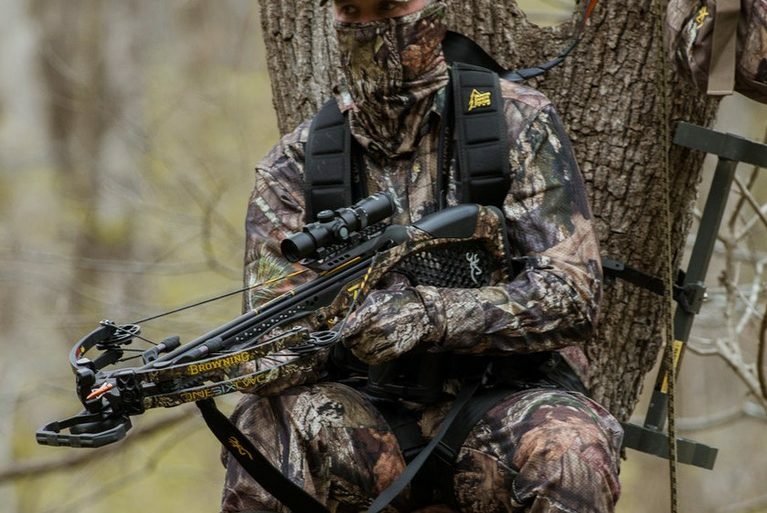 In November, when it’s time to switch from bow to gun, I relocate my field-edge treestands farther into the forested side of this transition zone, staying within gun range of the crop edge. Big old-timer bucks seem to know when gun season starts, no doubt due to the sound of gunshots echoing across the countryside. That’s when many of the bruisers go nocturnal—at least until the scent of does begins to cloud their judgment, that is. Although food is not the attraction here, this transition zone offers one of the best ambush sites for big bucks. Essentially, the convergence of these two habitats creates a dynamite funnel, with the deer following the easier to traverse hardwoods edge. What also makes this bottleneck ideal for intercepting big bucks is that it’s often within the shelter of the forest, or at least fringed with thick vegetation such as chest-deep beaver hay. As a result, deer feel secure moving through here during the day. This is one of my favourite transition zones to hunt during the rut, when the does are in heat and all the bucks are in top gear, hurriedly search- ing, challenging and fighting for breeding rights. The ultimate set-up features an incline in forest topography, where there’s a hardwood ridge providing the perfect vantage point to watch over the water’s edge. There should also be an obvious deer travel route below the beaver dam. If you find a ridge within range of the flood, hike to the top and set up a ground blind so that you’re overlooking the end of the pond. This is the best place to ambush a rutting buck. If there are no ridges in the forest bordering the pond, hang a treestand instead to gain an elevated view of deer as they cross below the dam. There’s a good bet you’ll find the border of a deer bedding area where a hardwood forest blends into an expansive stand of ever- greens. Whitetails often seek a mature grove of conifers to stay hidden and cool throughout the day, while the hardwoods edge makes for an ideal big-buck travel route. Bucks can’t resist making rubs and scrapes along the perimeter of their bedrooms—find these telltale signposts and you’ll know you’ve found a hot spot with tremendous potential for daytime buck movement. Not surprisingly, this transition zone is a favourite among seasoned buck hunters from the October pre-rut right through the November rut. 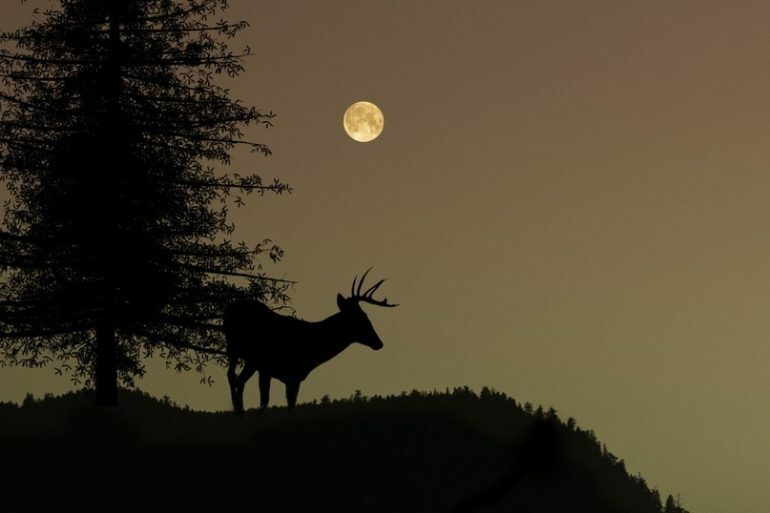 Mid-Autumn mast season, and in this transition zone, big bucks can gorge on nuts to their heart’s content, staying hidden within the forest until after twilight. Mature oak and beech trees can produce a plentiful crop during peak years, making it seem as though the deer have vanished from the open fields, or even vacated the property altogether. The ideal mast trees are those growing close to areas where the habitat becomes wetter, and where the forest’s transition to the evergreens provides added concealment for day beds. This enables bucks to travel a short distance from their bedding areas to feast, then quietly return. During the pre-rut, bucks devour acorns to bulk up and prepare for the weeks of intense action that kick off as soon as the first does come into heat. Trees such as southern Ontario’s iconic white oak are best, as they produce mast every autumn, making them a predictable food draw year after year. During the post-rut, if there’s little or no snow, bucks will again turn their attention to eating mast as they try to recover the weight lost from weeks of lust-filled, sleepless nights of rutting. This resurgence of appetite also leads to more daytime activity, meaning all late-season hunts should be geared around the buck’s belly. This is an unusual habitat transition zone in that deer sometimes elect to head straight across the opening, once it’s overgrown, rather than sneak along the edge. I believe it’s because they don’t perceive the hydro line to be overly open due to the prominent tall shrubbery and saplings that typically sprout up. Indeed, deer become accustomed to the shelter of the summer foliage dappling a hydro cut. And since it conceals their movements, the deer become complacent. By the time gun season arrives, the foliage has disappeared, exposing the deer trails—and the deer themselves. When scouting this transition zone, pay close attention to topography. Deer will traverse over- grown hydro lines along low points and through tall grass that keeps them hidden from sight. Created through years of deer travel, these paths should be quite obvious, especially in areas with healthy deer populations. Look for an elevated rise in the middle of the hydro cut where you can brush in a ground blind alongside some natural cover, such as a juniper bush. 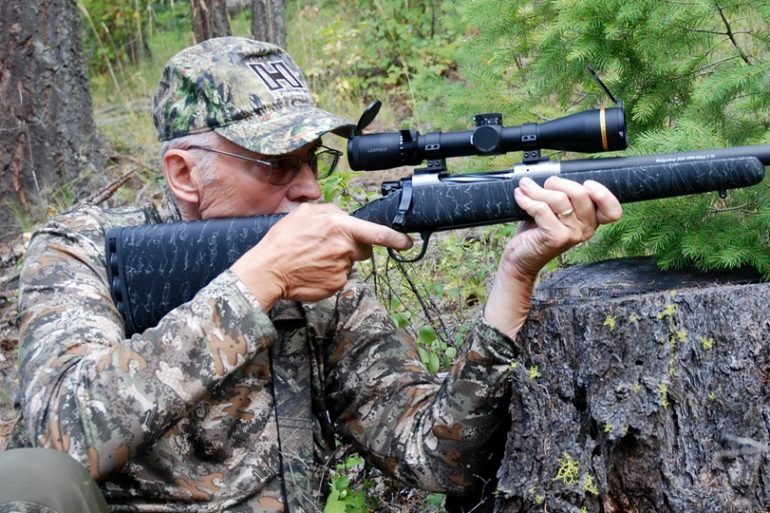 This set-up will give you plenty of time to size up deer travelling in either direction. If there’s no knoll or outcrop in the cut, a well-positioned treestand along the forest edge can also allow you to see down into the deer trails. If you opt for a treestand, scout just inside the shelter of the woods, as there’s often a deer trail running parallel to the cut. If you discover one of these hidden runways, position your stand and cut shooting lanes so that you can see both it and the trail running through the cutline. On many occasions, sneaky bucks have been known to troll just inside the woods. When hunting a hydro line during the pre-rut, I create two mock scrapes about 10 metres out from the forest edge. I position them 20 metres apart, close to either side of the game trail. With two mock scrapes, you double the chances a buck will activate one and attract more deer to the set-up. Make sure that there’s a branch tip about a metre above each scrape for the bucks to lick, or the scrape will never take. The scrapes should be close to the forest edge so that bucks will be confident enough to step out to work them during daylight. The best location is beside a game trail in a low-lying hidden area of the hydro line. This transition zone makes for prime white- tail habitat, and it can be productive all season long. It provides an ideal secluded bedding area, nearby water for secretive midday drinks, and a food supply along the edge. What 200-pound 10-pointer would turn that down? And because such transition zones are difficult to access, humans rarely disturb them—the perfect monster buck haunts. If winter comes early, deer will also gravitate to these areas to seek shelter from the snow and cold. If your region offers a December muzzle- loader season or a post- rut archery season, these transition zones should be on your radar. After hunting this type of transition zone for many years, I’ve found it’s generally best suited to a ground blind. Hike or still-hunt along the down- wind seam of the two habitats until you find a deer trail emerging from the cedars at the edge of the wetland. While care- fully skirting the wetland, watch for a fresh buck rub line, scrapes or both. If you find a few of these signposts in the vicinity of the trail, backtrack 20 metres and sneak into the cedars on the down-wind side. Set up your blind within range of both the trail and the edge of the wetland, creating a triangular ambush site. Clear three shoot- ing lanes that can be covered out of one window (only open one window so that the interior of the blind remains as dark as possible to conceal your movement). Direct one lane toward the water, with the other two lanes facing the trail, 10 metres apart. In this tight cover, if a buck manages to sneak past the first lane on the trail, you’ll have a second chance 10 metres on—putting you in the right place at the right time.